The Metropolitan Opera revives Don Carlo. Giuseppe Verdi’s operas conquered his native Italy in the 19th century, He then set his sights on Paris, (the center of the operatic world at the time) as his next goal. 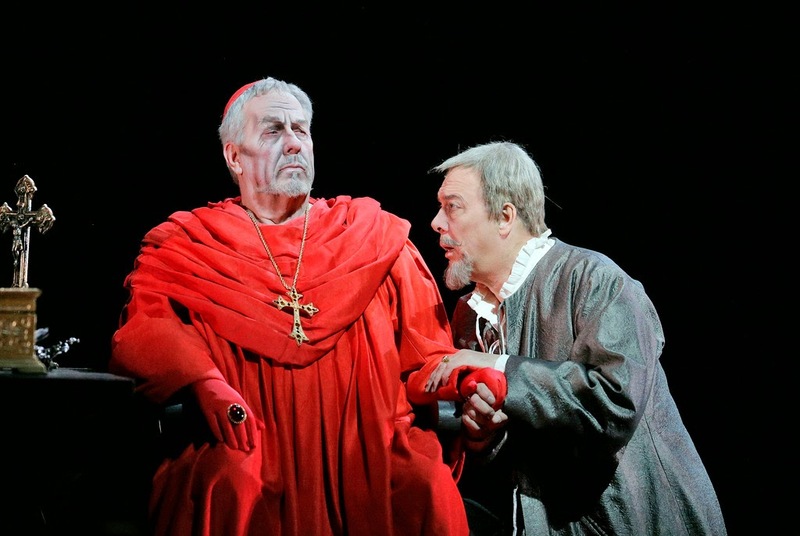 Don Carlo (originally: Don Carlos) was his third and final attempt at French grand opera. Verdi adapted a play by Friedrich Schiller into a sprawling five-hour examination of the troubled Spanish royal family in the reign of King Philip II. The Met's current production trims the opera down to four and a half hours. Standard cuts were taken, including the opening scene and the Act Three ballet. The opera was performed in Verdi's Italian translation of the libretto using the composer’s 1885 revision of the score. On Thursday night, the second performance of the opera this season featured the large cast, orchestra and chorus in taut, precise form under the baton of conductor Yannick Nézet-Séguin. The title role, the unstable and love-struck son of King Philip was sung by tenor Yonghoon Lee, who brought a pleasing, if smallish upper register and a voice anchored by a solid, baritone core. He maintained bright sound through this marathon opera, from the opening arietta "Io lo vidi" to the overwrought Act V duet with Queen Elisabeth--his father’s wife and former fiancée. A sense of confusion and tragedy permeated this performance, which is vital to interpreting this dark and troubled character. Barbara Frittoli was Elisabeth, warm and sympathetic in the Fontainebleau act, resigned to her fate for the remaining four. She sang with hard, bright tone in the first scene but her voice opened up and warmed as the opera progressed. She was matched blow for blow by mezzo Ekaterina Gubanova as her rival Princess Eboli. The ferocity of the latter’s "O don fatale" in Act IV was matched by Ms. Frittoli’s weighty performance of "Tu che la vanita" in Act V, with each singer portraying very different souls in torment. The handsome Siberian Dmitri Hvorostovsky continued his traversal of the Verdi baritone repertory as Rodrigo, the Marquis of Posa. This idealistic nobleman whose revolutionary idealism and complex relationship with Carlo makes him a confidante of Philip and a target of the Spanish Inquisition. Mr. Hvorostovsky served as a smooth fulcrum for the opera’s key ensemble scenes. melted hearts with his long death scene in the fourth act. Although he does not sing until halfway through Act II, King Philip remains the central figure of Don Carlo. Ferrucio Furlanetto owns this role in this production, and dominated the action from his entrance. His dark and woolly sound captured the complex nature of the troubled monarch. In the Act IV scena with the Grand Inquisitor (James Morris) the two basses squared off, trading the roles that they had sung in the Met’s previous production. At the end of his long career, Mr. Morris’ instrument has turned wan and trebly, but that made his Inquisitor sound even more querulous and fanatical. Mention should also be made of bass Robert Pomakov, a day-of-show substitute in the small but authoritative role of the Friar. Although this 2010 production omits the opening scene of the opera (featuring a chorus of starving, frozen woodcutters in Fontainebleau Forest) the Met chorus was an omnipresent character in this vast drama. Verdi uses the chorus much like the Russian people in Boris Godunov, cheering on the burning of the heretics in the Act III auto-da-fé and rising in brief rebellion in the prison scene. From the pit, Mr. Nézet-Séguin commanded these vast forces with authority and drive, showing himself a brilliant audacious leader of this grandest of Verdi operas.